Based on Jumptap, a mobile ad network, Android is dominating the U.S. If you look at the July 2011 Mobile STAT, Android is leading with 38% of the market share in Jumptap Network. iOS is second place with 33% market share. Blackberry OS is third palce with 22% market share. Competitors such as Symbian and webOS have very little control over market share. One advantage that iOS has is that since is that is has higher advertising interaction. iOS dominates CTR, Click-Through Rates. The average click-through average is .52%. iOS consistently surpasses the average with a .78%. Android is below the average with a .47%. The July 2011 Mobile STAT also showed mobile trends, such as a rise in click-through rates among consumers under 34, but a decline for older users. Jumptap also made a diagram of the United States and pointed out which states are dominated by which Operating System. 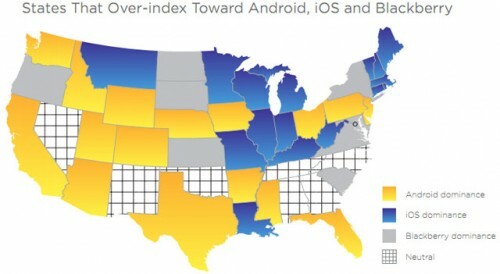 It appears that Android dominance is found in the South and Southwest, while iOS dominace is found in the Northeast and Midwest states. ios is on 1 device only android is on many and considering that there is only 5% less difference between android and ios, it just goes to show how strong the iphone is as a standalone product compared to androids say 50 or more . my balls have much larger market share.